Maureen O’Neill, cancer victim and Hospice of the North Shore patient, died 15 years ago today, May 9, 2003. In January 2003, I contacted the Danvers-based hospice now known as Care Dimensions about the possibility of following the life and trials of one of their patients. They introduced me to Danvers resident Maureen O’Neill. 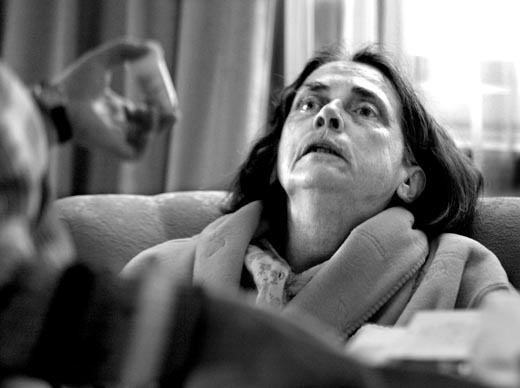 I spent the majority of my time with Maureen, at her house and beyond, from the time she returned home from Salem Hospital to the moment of her death. I often think about the first time I met Maureen. In order for this project to go forward, Maureen insisted on meeting with me first and seeing some of my photography work. I brought my photo portfolio to Salem Hospital, just a few days before she was to be released to the peaceful confines of her home. 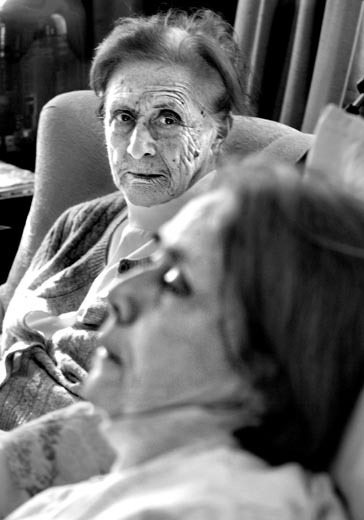 Maureen chose to bypass chemotherapy to die at home with her 92- year-old mother at her side. One of the first photos in that portfolio was a mother duckling and her babies crossing a busy street in Waltham. Maureen loved the photo as she was a huge bird lover. We hit it off from that moment forward. The following photos are dedicated to Maureen’s loyal friends and family, Care Dimensions, and most of all, Maureen, who wanted to show the benefits and dignity of dying at home. 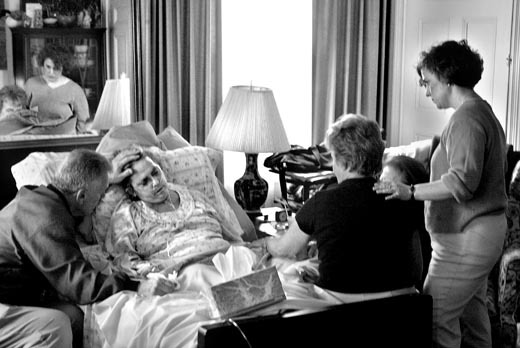 Above & below: Cancer victim Maureen O’Neill, wishing to die at home with her mother, returns home from the hospital after realizing Chemotherapy was not going to work against her cancer. Maureen O’Neill shares a laugh with Hospice Nurse Ann-Marie DePaolo and mom Ann. 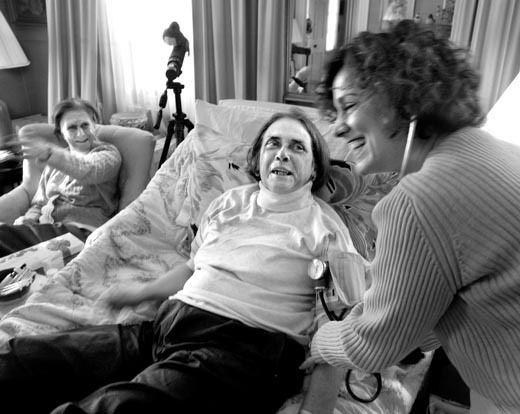 After a difficult morning, Maureen O’Neill is instructed on her medicine usage by Hospice Nurse Ann-Marie DePaolo. 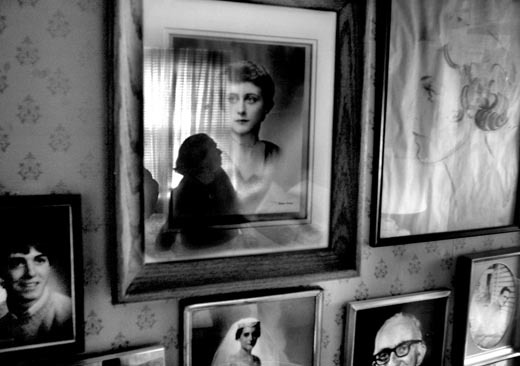 Maureen O’Neill sits on her Mom’s bed as she talks about her family. 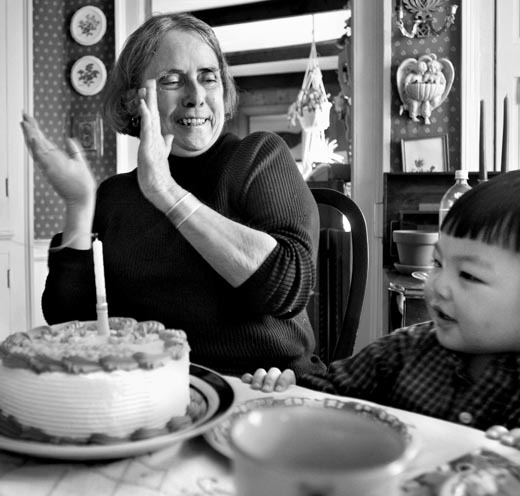 Maureen O’Neill celebrates what would be her last birthday, her 63rd, with Josh, her friend’s grandson. 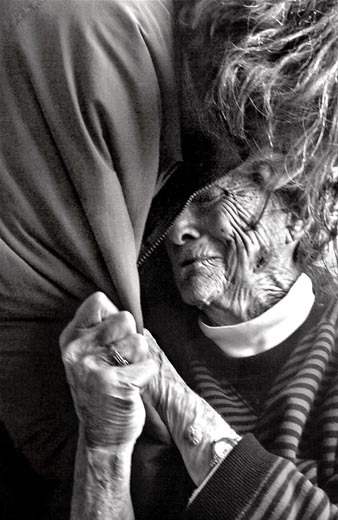 A tired Maureen O’Neill is watched over by her mom Ann. 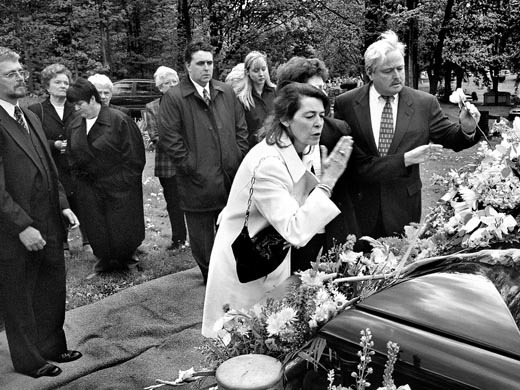 As friend Bob Supino places one hand on Maureen’s forehead and one hand on her pulse, Maureen O’Neill dies in her Danver’s living room with best friend Glenda, mother Ann and Hospice Nurse Ann-Marie DePaolo at her side. 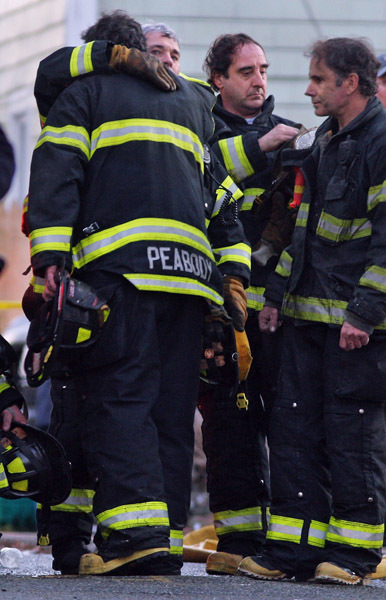 Firefighter David Atherton did not die in the line of duty. 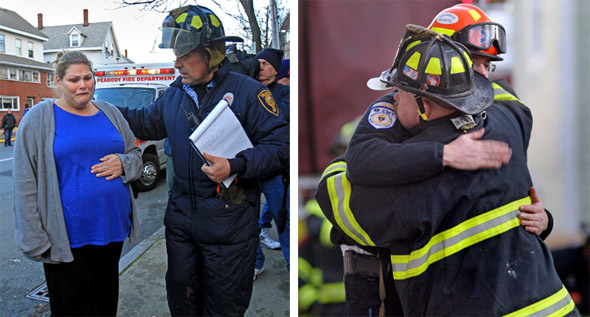 That fact didn’t matter this morning to his fellow Stoneham firefighters and his brothers and sisters at the Boston Fire Dept., as they saluted and escorted his body from the Office of the Chief Medical Examiner. Atherton was accidentally shot and killed by a lifelong friend. 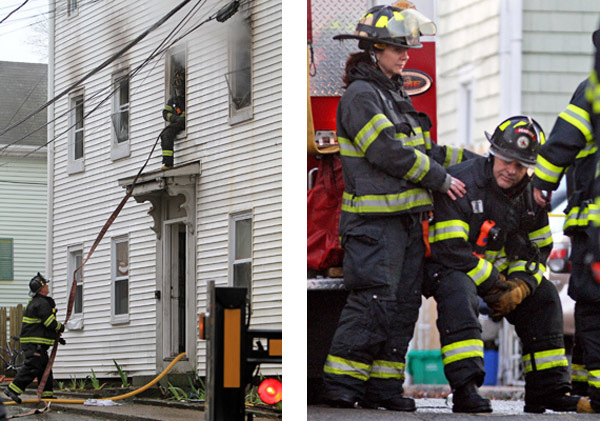 See that Boston Herald story here. 07/01/2016-Boston,MA. Stoneham firefighters salute as the body of fellow town firefighter David Atherton leaves the Boston office of the Chief Medical Examiner Friday morning. Atherton was shot and killed while off duty earlier this week. 07/01/2016-Boston,MA. Boston firefighters salute as the body of Stoneham firefighter David Atherton leaves the Boston office of the Chief Medical Examiner Friday morning. Atherton was shot and killed while off duty earlier this week. MIT Police Chief John DiFava is seen one minute after today’s moment of silence to honor those who died in the Boston Marathon bombings, including MIT police officer Sean Collier. 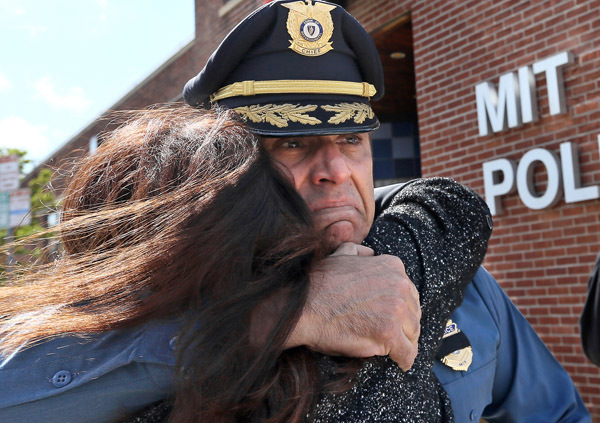 The chief received a hug from one of approximately 200 people that lined the sidewalk in front of the MIT police station to commemorate the horrific event. Please see tomorrow’s Boston Herald, as columnist Peter Gelzinis talks at length to the chief. This was a sad news event to cover for sure as word of the death of firefighter James Rice started to spread to working firefighters at 5 Hancock street. See my photos below.